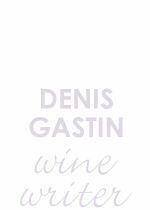 Denis Gastin grew up in wine country in Central and North East Victoria and was introduced to wine around the family table. He got a taste for the commercial side of the wine industry when he set up and managed the Australian Wine Promotion Program in Japan in the mid 1980s, when he was the Senior Trade Commissioner and Minister (Commercial) at the Australian Embassy in Tokyo. Denis has been determined to share his passion for wine in general, and for Australian and Asian wine in particular, with others who have an interest in wine. His first wine writing assignments were in Japan, with Vinotheque Magazine and with Wine and Spirit Magazine. In the early 1990s he was also writing the monthly feature story on wine in Asian Hotel and Catering Times, a magazine for the hospitality industry published in Hong Kong. In these stories he traversed the full range of wine issues: from the wine markets of Europe, to the burgeoning new industries in South Africa and Chile, the historical origins of wine in China and Japan and, of course, his special interest - Australian wine. In the early 1990's he was also writing a monthly column on Australian wine in Campai Magazine, a lifestyle magazine published in Japan. He has written feature stories for a number of airline in-flight magazines and for a wide range of wine publications throughout Asia, including Japan Sommelier, Wine Ark, Wine Kingdom, Vinotheque, Wine & Spirit, Gastro and Tattler. He has been Australian Correspondent for Japan's Shuhan (Liquor Retail) News in Japan since 1998 and for Korea's Wine Review magazine since 2003. In Australia, Denis is a member of the Editorial Panel for Wine Titles Co, the publisher of Australian & New Zealand Grapegrower & Winemaker Magazine, and is also a contributor of articles to this magazine. He was the wine columnist for Universal Publications (Sydney Living, Melbourne Living, West Coast Living and Luxury Home Design). In 1995 Denis was invited by one of the English-speaking world's outstanding authorities on wine, Jancis Robinson, to contribute to her mega-project: The Oxford Companion to Wine. He has contributed the Asia content to the 1st, 2nd, 3rd and 4th editions of The Oxford Companion to Wine and the 3rd, 4th, 5th and 6th edition of The World Atlas of Wine. He was the source of the Asia content in the 4th edition of The Sotheby's WINE Encyclopedia. He was the author of the Asia chapter in Wine Report (3 times winner of 'Best Wine Guide' in the Gourmand World Cookbooks Awards). This was the annual update of the word of wine, by region, and was published annually between 2004 and 2009. Leader of the Australian Wine Industry Study Mission to China (September(2007). business affairs for The Australian and Business Asia magazine until 1996. He was Editorial Advisor and contributor of articles to The Diplomat Magazine in the 2000s. He has been Managing Director of INSTATE Pty Ltd, an international strategic planning consultancy, since 1990.